Close battle on the menu for Cabbage Tree race. 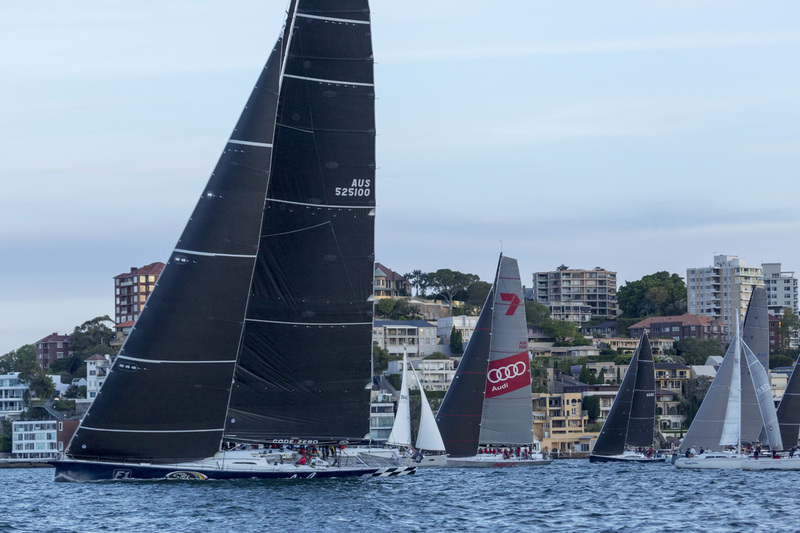 Three of the big names in this year’s Rolex Sydney Hobart will line-up against one another in this Friday’s curtain raiser to the Boxing Day classic. 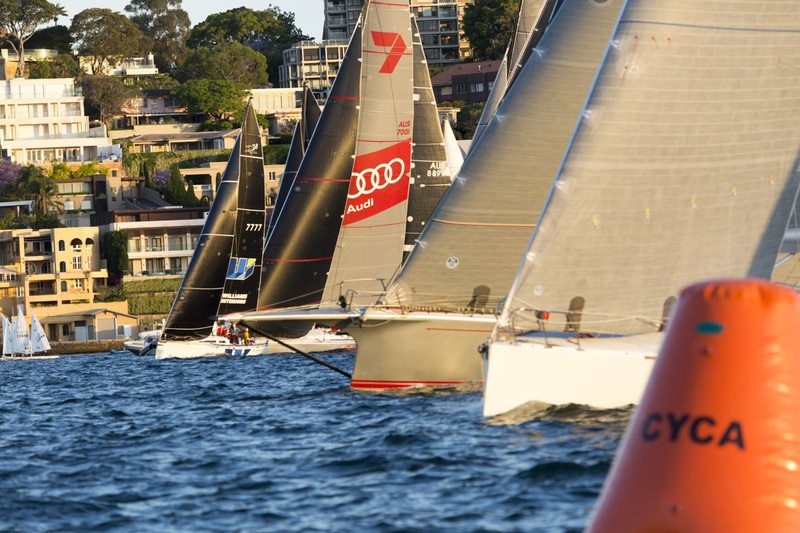 Supermaxis Comanche, Wild Oats XI and Black Jack headline a 46 strong fleet entered for the 180 nautical mile race which starts on Sydney Harbour at 7pm. The race track takes the yachts to Cabbage Tree island off Port Stephens, then back to the Harbour. Black Jack skipper Mark Bradford is looking forward to the hit-out between the trio, given the thrilling finish to the Noakes Sydney Gold Coast Yacht Race in July in which the Peter Harburg owned Queensland supermaxi match-raced and beat Wild Oats XI to the finish line by just under two minutes over a 384 nautical mile course. The start line for the 2017 Cabbage Tree Island Race. 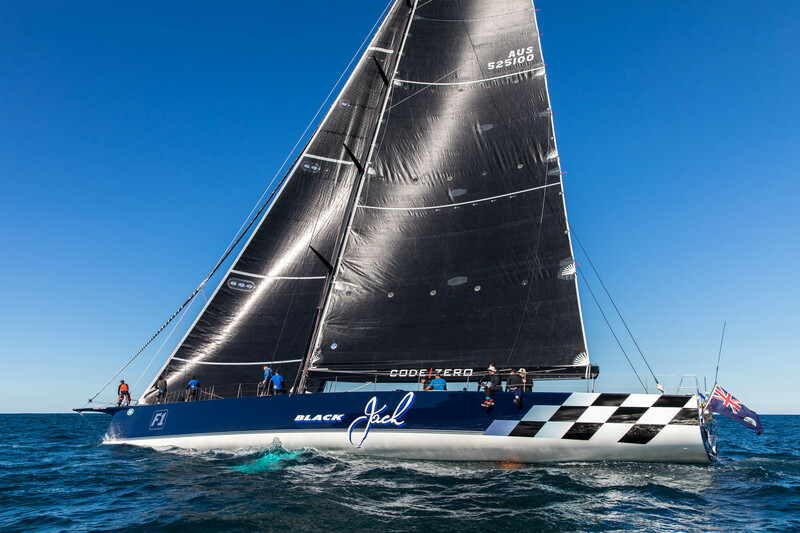 Black Jack during the Cabbage Tree Island Race. Bradford or “Squark” acknowledges getting a good start is critical in squeezing-out early gains in the forecast 14 knot nor’ easter which will see the fleet tacking out of the harbour. “It’s not a bad forecast for Oats and us. Comanche have been doing a lot of sailing, so they’re probably going to be the sharpest in terms of manoeuvres. “The starts are a big deal in these things because if you are a little ahead of the other boats and the breeze gets to you first you have early advantage, so it’s about getting out of the harbour cleanly,” he emphasises. 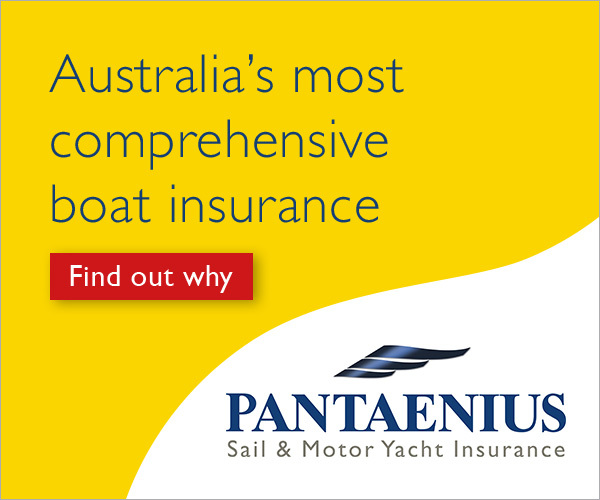 All three boats have been working to tweak performance since the Gold Coast race, for Black Jack that’s involved a serious program of evaluation aimed at boosting upwind performance. “We’re expecting to be more competitive than we have been in the past. We’ve strengthened the boat and dragged our wind range up a bit – we’ve pushed into the 12-13 knot range. “We’re about to change our sail configuration and that will happen in time for Bird Island, other changes are stability related. We have more righting moment then we’ve ever had before. The new sail configuration will be ready for the Bird Island race,” he reveals. Black Jack in race mode. Grabbing the lazy sheet off the A3 before changing sails in the Pacific Ocean. Black Jack will also have a reaching strut for the Cabbage Tree race, “basically what it’s about is triple-heading”, Bradford says referring to the practice of setting three front sails. Specialist sails for the appendage arrive next week. 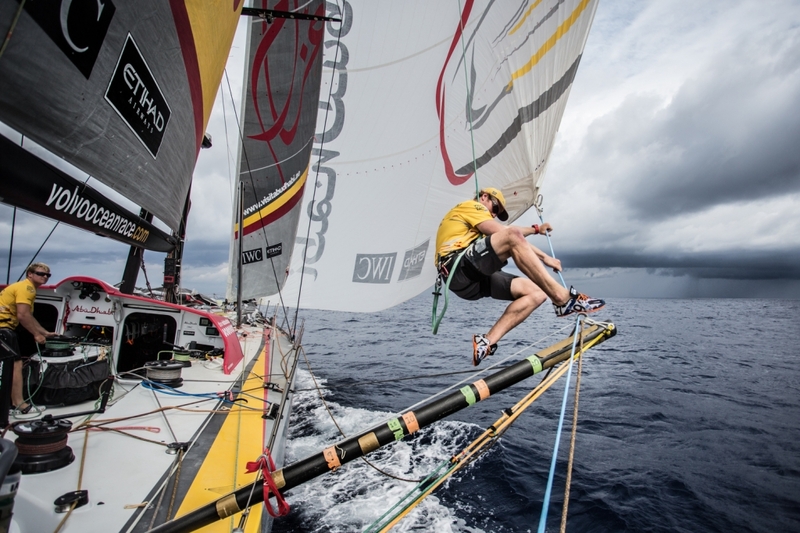 Bradford rates the reaching strut as one of the “big gains” from the 2017/18 edition of the Volvo Round the World race. Essentially, it’s a small pole you can use to push the downwind sails further out, expanding the sheeting angles. “It means your deck plan is expanded,” he says. “Everyone’s doing it. In IRC the rule is the reaching strut can only be attached to the mast.” (In the Volvo it was attached to various hard points). “So the configuration for us is basically from the mast forward whereas in the Volvo they had big overlapping sails and pushed them further back, but that hasn’t made it to our rule yet,” he notes. Black Jack also has first-rate talent backing-up its systems upgrades. Familiar names with a wealth of experience include crew boss Dean Phipps from Rambler and ex- Alinghi, along with fellow kiwi legend Brad Butterworth who won’t be onboard for Friday night, but will be calling tactics on the supermaxi from Bird Island onwards. Cabbage Tree will be a major opportunity for many crews to test their preparation and hone their skills ahead of the main event, the Rolex Sydney Hobart. Matt Allen’s Ichi Ban, the 2017 Hobart overall winner, has displayed ominous form in other lead-up races. It is one of six TP 52s entered for Friday night, and the uber-competitive class should set the pace on handicap given the forecast conditions of upwind sailing on Friday night, with the northerly expected to hold in on Saturday making for a fast run home. Last year’s outing to Cabbage Tree island and back was a mainly light affairs affair with Black Jack completing the journey in under 21 hours.